Among saltwater angelfish the Queen Angelfish (Holacanthus ciliaris) is one of the most colorful and visually stunning. This fish originates from the Caribbean and Western Atlantic and is highly sought after for its exotic coloring, which is blue/green over much of the body and a peculiar radiant blue ‘crown’ on its forehead giving it its name. While there are variations in colors (some with purple and teal colorings) depending on where this fish comes from, it offers some of the most vibrant hues found in all the species of saltwater angelfish. 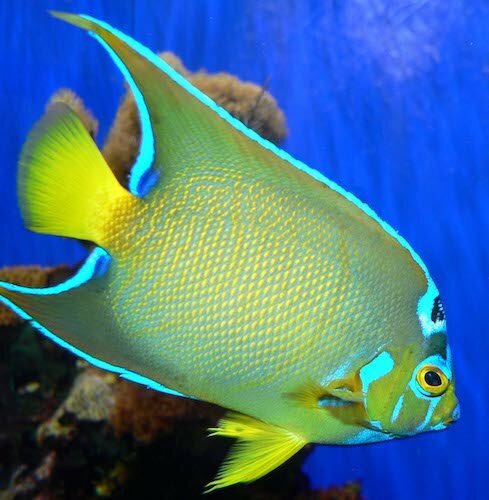 Because of their grace, beauty and elegance, the Queen Angelfish is a favorite among hobbyists. Because of their size and demanding nature, however, they’re best kept by the intermediate to advanced hobbyist. 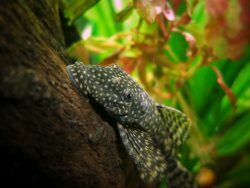 This fish gets big — up to 18 inches in length, which means you’re going to need a very large tank in which to house them. Most experts recommend at least a 180 gallon tank, but 220 and up is recommended if you plan on keeping a male and female pair. If you put them in a space that’s too confined, they will likely go after their tank mates, and will probably become stressed, which can bring on disease and death. If you house these fish with other angels be careful that they’re not the same size, same color of have a similar body shape. You should also be aware that these fish will attack new fish added after them, so consider making this the last fish you add to your setup. As with most species of saltwater angelfish, the Queen Angelfish requires close attention be paid to water quality. In the home aquarium they prefer a water temperature of 72˚ – 82˚ Fahrenheit with a pH range of 8.0 – 8.4, medium water hardness, and a specific gravity of 1.020 – 1.025. These fish are very susceptible to stress, which makes it all the more important that you maintain good water quality by performing regular water changes and pH tests. You should perform a 10-15% water change every 2 weeks for tank sizes of 180 gallons, and 30% water changes every 3 to 4 weeks for tanks over 250. Also be aware that because these are big fish, they consume a lot of food and put out a lot of waste, which can cause water to foul quickly. It’s also vital that these fish only be added to a biologically mature tank that’s been up and running for at least 6 months. Also be sure to include plenty of live rock with naturally growing algae they like to graze on. Lastly, be sure to give them plenty of hiding places they can duck into in case they feel threatened. It should be noted that the Queen Angelfish is an aggressive fish and it’s not recommended that they have small, passive fish as their tank mates. 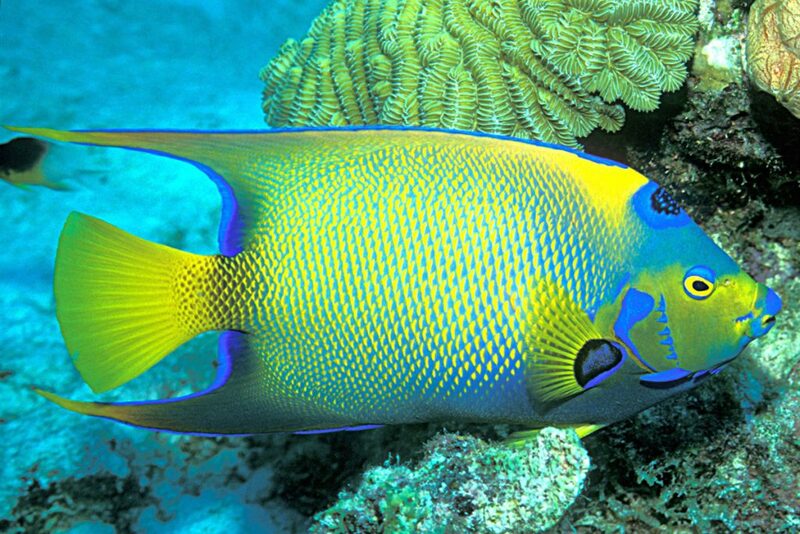 The Queen Angelfish isn’t considered to be reef safe. Your corals may be safe with juveniles, but adults will destroy just about everything else. 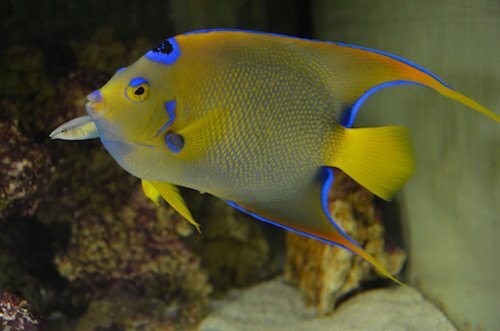 Saltwater angelfish are prone to a number of diseases and parasites that plague the home aquarium and the Queen Angelfish is no exception. 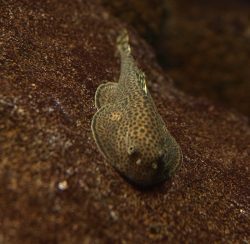 Although they’re a fairly hardy fish once they become acclimated to their new environment, stress can lead to disease. Stress is most often caused by housing them with inappropriate tank mates, failing to maintain high water quality and feeding them a diet in which they fail to get proper nutrition. 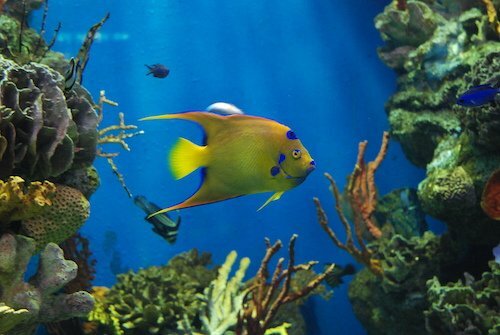 The most common disease affecting the Queen Angelfish are White Spot Disease (Cryptocaryon irritans) also known as Saltwater Ich, Marine Ich or Crypt. You can tell if your fish has this disease by the white spots that appear over its body and by its scratching against rocks. While these diseases are serious, and can be tough to get rid of, they’re mostly preventable so long as you give them a healthy diet, maintain good water and provide them an environment in which they can thrive. Source: flickr.com | Shankar S.
As with most saltwater angelfish, the Queen Angelfish is an omnivore and likes to feed on filamentous algae in the wild. They also like to dine on sponges, phytoplankton, jellyfish and hydroids. In the home aquarium, you can keep these fish happy with a diet that includes a variety of vegetable-based foods. You should only choose high quality food that includes sponge and Spirulina. The Queen Angels also like fresh, uncooked broccoli, which is a good source of vitamin A and C. For variety, consider giving them treats of small amounts of meat, such as brine and miss shrimps. It’s recommended that you feed them 2 to 3 times a day. As of this writing, no known cases of successful breedings in captivity have occurred. If you wish to keep a male/female pair you can tell the differences in the sexes by noticing the male is slightly larger. The Queen Angelfish is one of the most magnificent and elegant of all the species of saltwater angelfish. When you see these graceful creatures up close and in person, it’s easy to understand why so many people want to keep these in their homes. 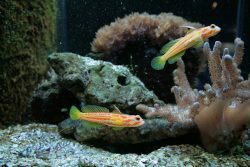 They’re readily available at most reputable aquarium dealers, and as long as you give them the care and attention necessary, they can provide you with joy for up to 20 years.